For the very first time the worlds largest class cruise ship Oasis of the Seas has called at the popular British port of Southampton. To the delight of hundreds of locals watching on shore the ship arrived into Southampton. The weather wasn’t so good with fog and gray clouds but that didn’t sour the onlookers who have been looking forward to watching the worlds largest cruise ship ever since news broke it would be calling at the UK. Oasis of the Seas was also met with a large tug boat that was spraying water. This is traditional when a ship enters a port for the very first time especially a ship as important as Oasis. A 14-day drydock had just been completed in Rotterdam the day before where many new enhancements and features were added. Guests will now board the vessel through out today (October 15th) and will be some of the first to experience the updated Oasis of the Seas. This will be an important visit as the UK is one of the largest cruise markets in Europe and is an essential hub for most cruise lines. Sister ships Quantum of the Seas and Anthem of the Seas will both be cruising from Southampton in the future so the Oasis visit will also give a boost in promotion. The vessel will tonight sail to Vigo in Spain and then end up back in its usual home port of Fort Lauderdale, Florida. 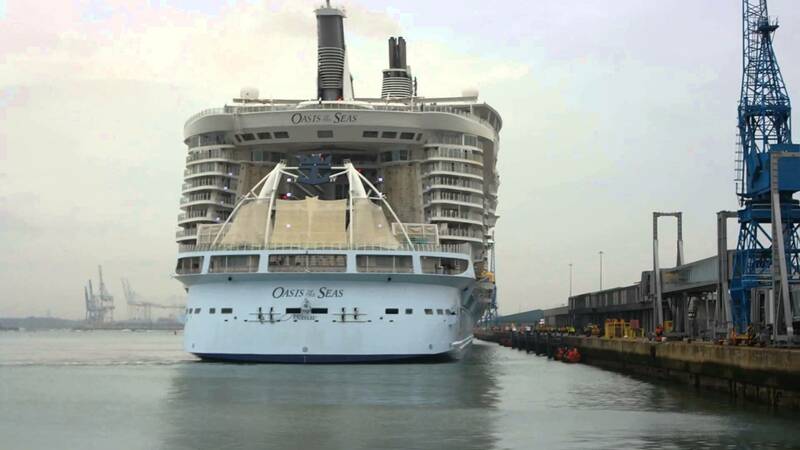 Oasis of the Seas can carry 5,400 passengers and there are already another two oasis class vessels ordered to be built. Allure of the Seas is also in the same class and will have a drydock in Rotterdam in May 2015.